Orange Pi is one of the first names that comes to mind when thinking of Raspberry Pi alternatives, and the latest device in the lineup – the Orange Pi One Plus – was quietly launched last week by Shenzhen Xunlong. It is currently listed on AliExpress at a super-affordable price of $19.99 excluding shipping and handling. In case you’re not part of the DIY scene, Orange Pi, much like its more illustrious counterpart, Raspberry Pi, is an open-source single-board computer that can run a wide variety of Linux kernel-based operating systems including, Android, Ubuntu, Debian, Fedora, Raspbian, ArchLinux, openSUSE, OpenWrt, etc. You can use it to create a wide variety of gadgets, including, but not limited to, computers, web servers, CCTV cameras, weather radars, media players, etc. However, there are a few things you need to keep in mind. 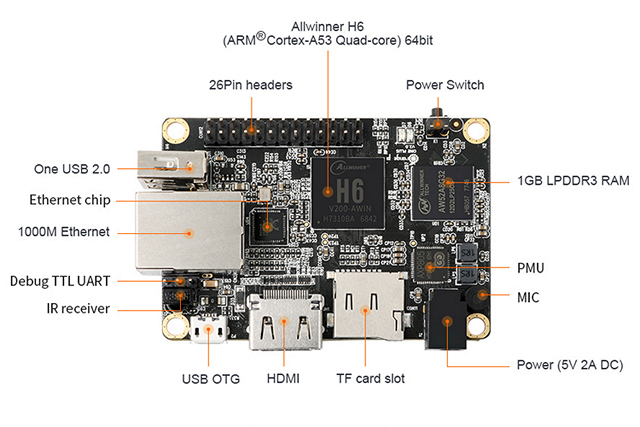 This being the first Allwinner H6-based Linux development board, it’s very likely that there might be some growth pangs even when developers are able to successfully port Linux distros on it. That’s due to inadequate drivers support in the past. Hopefully, though, better support will come from the endlessly-enterprising linux-sunxi (u-boot/kernel) and Armbian (integration with Ubuntu/Debian) communities, who are most likely to start tinkering with this board.